Hartlepool United got down to work in Tenerife today as Craig Hignett’s pre-season preparations move forward with pace. Pools began their stay at the state-of-the-art La Caleta resort with a fairly gentle introduction following a long day of travelling yesterday. But Hignett explained the week will involve a great deal of “hard work” with Tenerife the perfect place to do it. “It’s all planned, every day, every session,” said the Pools boss. “I know what we are doing and there is a pattern to everything. 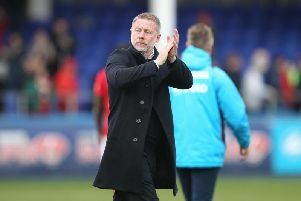 Hignett said there was frustration that there were to be no friendlies while in camp. Two had been pencilled in – for tomorrow and Thursday – only for the friendlies to fall through. It means Pools will go into next Wednesday night’s visit of Sunderland with only one friendly under their belts – Saturday’s 4-0 victory at Billingham Town. But Hignett says he will stage an in-house 11-a-side match this Wednesday. “We are disappointed we haven’t got a game out there, we were due to have a couple but they’ve not happened,” he said. “We’ll play at least once, but it will be against each other – we have enough players out here to have a full 90-minute practice game. “We would have preferred games against teams and we were promised a couple and have been let down. “The lads will get a 90 under their belts but, overall, we will have a tough week of training. “This place is ideal for us to do our hard work. “We’ll have a really good training week and do some specific work in Tenerife. “We’ve been doing a lot of general football stuff, but now we’ll specialise more, working in groups and units. “We can get on with how we defend as a unit, this is how the midfielders come into itm how strikers defend from the front, attacking wise this is how we’ll attack and these are the patterns we’ll use. Given Saturday’s match and a long day yesterday, both on the road and in the air, Hignett said that the real graft would start tomorrow. “There’ll be nothing too strenuous first day,” he told SportMail. “We’ll get the travel out of the legs and get going. “Tomorrow will be tough, we will play our match on Wednesday, and Thursday will be a warm down. “But then Friday and Saturday will be tough days.